J.T. 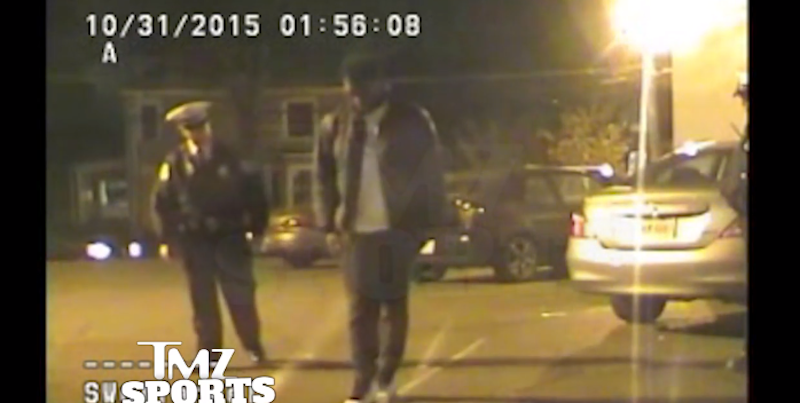 Barrett During Drunk Driving Arrest: "I'm The Quarterback Of Ohio State"
Ohio State quarterback J.T. Barrett was arrested and charged with operating a vehicle while intoxicated after being pulled over and reportedly blowing a 0.099 into a breathalyzer (the legal limit for underage drivers in Ohio is 0.02) on Oct. 31. TMZ has since gotten their hands on the dashcam footage of the 20-year-old’s arrest, and it shows Barrett doing what a lot of famous people do when they get pulled over: asking for a break. At about the 1:15 mark, after Barrett has been cuffed off-camera, you can hear him say, “I’m the quarterback of Ohio State... there’s nothing you can do?” The police officers arrested Barrett anyway, and then had a laugh about the fact that Cardale Jones was coming to pick his teammate up.